See what I am working on? Those are socks! Those are Lenore socks! 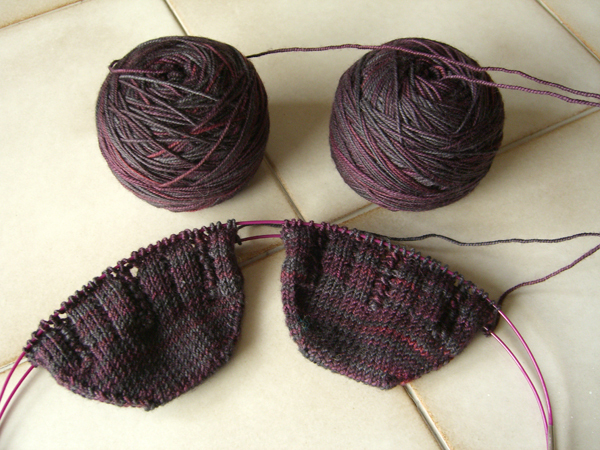 Yes, I’m knitting them toe-up. So sue me. Yes, I realize the cuff lace is directional. I have swatched it. No, I don’t know what I’m going to do when I get to the top of the legs. Yes, I will figure it out some time before I get there (I hear you, Pat). The Great Green Glob is off the needles! It’s still very glob-like sans blocking. But the knitting is done. I’ve ordered some blocking wires from Knit Picks, but they haven’t come yet. If they’re not here by Saturday, I’ll probably just take it over to Tangle and see if I can persuade the lovely Alice to let me block it there. Tangle is closed Thursday, of course, for Thanksgiving Day, but also Wednesday and Friday because they are getting new yarn, be still my beating heart! So I might be going over over on Saturday for more than just a little blocking. Not that I need any more Stash Enhancing eXperiences right now. I am working on Lenore, but other projects are calling my name, also, as you can see from the growing list of items in the queue over in the right-hand sidebar. And, speaking of sidebars, I did a minor WP upgrade on PI last Sunday and took the opportunity to do a little rearranging and pruning. All of my blogroll, except the Yarn Collectors, is now on the Links page. It’s getting longer and longer, but I hate to take it out completely. I’ve left all of you fellow Yarn Collectors on the front page. A post from Mims reminded me that there are ways we can give without even leaving the comfort of our own computers — and, actually, for free! Since I am guilty of not remembering to click on the GreaterGood click-to-give sites also, I have moved those links to the front page on the right just above the news. Please, click on those links every day and link to them yourself. In other news, #1 Son is ailing, but hopefully will be recovered soon. And I came home last night to find that Moo Cow had stripped the leaves from the lower branches of the silk dogwood in my living room, and obviously eaten the leaves which she had then thrown up in several strategic locations. I mean… I knew she would eat my yarns. But a fake plant? She has shown no interest in her breakfast, and has been curled up on a chair. I am watching her closely to see if her tummy is just a little upset or if she is going to require a more extensive look-see from the vet. Thankfully there were no wires in those leaves. And… sometime in the wee hours PI received its 100,000th unique visitor. Thank you to everyone who comes here. I hope you enjoy.